It has been said more than once in psychology that one person's effect is another person's error term. By minimising and occasionally ignoring individual and group variability cognitive psychology has yieled many fine achievements. However, when investigators are working with special populations, the subjects, and the unique nature of the sample, come into focus and become the goal in itself. For developmental psychologists, gerontologists and psychopathologists, research progresses with an eye on their target populations of study. Yet every good study in any of these domains inevitably has another dimension. Whenever a study is designed to turn a spotlight on a special population, the light is also shed on the mainstream from which the target deviates. This book examines what we can learn about general and universal phenomena in cognition and its brain substrates from examining the odd, the rare, the transient, the exceptional and the abnormal. Chapter headings: Introduction (N. Raz). Developmental Instability and Phenotypic Variation in Neural Organization (R.A. Yeo, S.W. Gangestad). Animal Models of Developmental Dyslexia: Lessons from Developmental and Cognitive Neuroscience (G.D. Rosen). Electrophysiological Correlates of Early Speech Perception and Language Development During Infancy and Early Childhood (D.L. Molfese). Developmental and Individual Differences in Short-term Memory (J.S. Saults, N. Cowan). 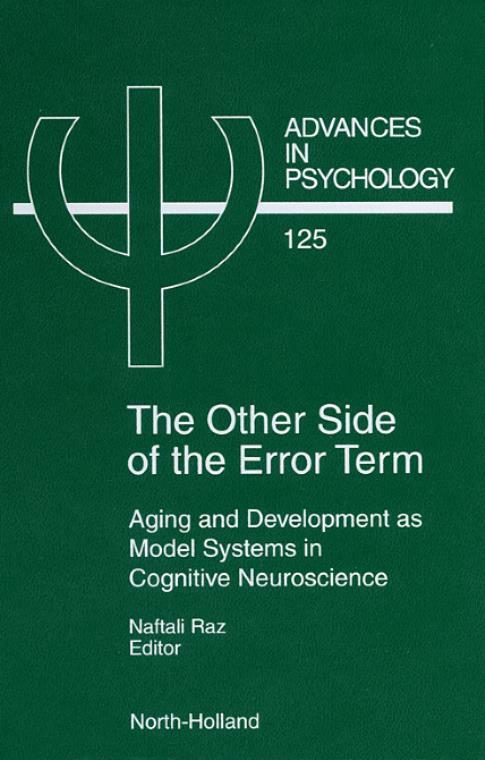 Lifespan Studies of Mental Chronometry: Insights Derived from Chronopsychophysiology (T.R. Bashore et al.). Differential Contribution of Frontal and Medial Temporal Lobes to Memory: Evidence from Focal Lesions and Normal Aging (E.L. Glisky). Does Working Memory Work in Language Comprehension? Evidence from Behavioral Neuroscience (A. Wingfield et al.). Problem Solving, Inhibition, and Frontal Lobe Function (J. Dorfman).